Meet the new boss: Incoming CPUC President Mike Picker imposes his will on the Encina gas peaker decision. Earlier this year, we suggested that the decision on San Diego Gas & Electric's Carlsbad gas-fired peaker plant would be a calling card for new California PUC President Michael Picker. If the Picker CPUC halted the $2.6 billion project, it would send a signal that renewables, or at least, the loading order, were being seriously considered. On Thursday, despite proposed decisions to halt the project, Picker's CPUC voted 4-1 to approve a new 500-megawatt gas-fired power plant in Carlsbad, Calif. Commissioner Catherine Sandoval was the lone dissenter. Sources close to the issue suggest that Governor Jerry Brown and Picker have long been in favor of getting Carlsbad done. Here's the long story, short. In July 2014, SDG&E sought approval for 600 megawatts of new natural-gas generation to replace the 965-megawatt Encina Power Station in Carlsbad as part of the Local Capacity Requirement (LCR) procurement. (Encina began providing power in 1954, and its current owner, NRG, must replace the plant, because of State Water Resources Control Board's once-through cooling rules.) The LCR procurement stems from the March 2014 decision guiding Southern California Edison and SDG&E to procure up to 1,500 megawatts of new generation capacity by 2022 to replace the retired San Onofre Nuclear Generation Stations, which closed permanently in 2013. The procurement mandates that "preferred resources" -- renewable energy, efficiency measures, demand response, and energy storage -- be considered and used in specified amounts. The CPUC's proposed decision in March of this year denied approval of the new gas-fired power plant, because SDG&E did not sufficiently consider preferred resources. Earlier this month, the CPUC again decided to consider the other options. Alison St. John of KPBS reports, "[CPUC] Commissioner Mike Florio said if they approve this plant, it could be the last fossil-fuel plant built in Southern California." In addition, "Picker said he is not eager to approve another fossil-fuel plant, but he reminded his colleagues of the blackouts that occurred in 2011 and stressed that regional energy reliability is at stake." Somewhat abruptly, Picker followed with an alternate proposed decision, approved on a 4-1 vote, that was driven by the necessity of getting the new plant on-line before the old Encina plant is retired. Picker's decision lowered the plant's generating capacity to 500 megawatts -- and the 100-megawatt difference was thrown to renewables. According to the San Diego Union-Tribune, NRG "disclosed a private meeting its executives had in March in San Francisco with Nicholas Chaset, the energy advisor to commission President Picker. At the meeting, the company proposed changes to the plan that other interested parties were not privy to. Three weeks after the meeting, Picker issued his decision overruling the administrative law judge who said the Carlsbad project was not needed." “This decision is an unnecessary gift to the developer,” said Bill Powers of the Protect Our Communities Foundation in a release. (POC is a San Diego group that is a party in the Carlsbad proceeding.) “The San Diego area is overbuilt with fossil-fuel power plants, and there is little demand growth,” he said. “Today, San Diego was the victim of another bad backroom deal at the Public Utilities Commission." 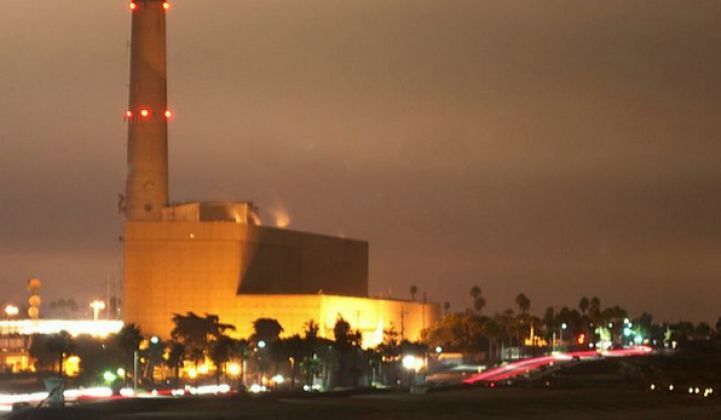 Earlier this year, NRG, the owner of the Encina plant, issued a statement that included this comment: "The decision to negotiate a PPA for the Carlsbad Energy Center represented the only viable approach to have the appropriate, flexible capacity on-line when needed to enable additional renewable generation and preserve the reliability of the grid." As reported by the Union-Tribune, Keith Casey of the California ISO said “We don’t know of any other resource besides Carlsbad that can be in place by 2018 that can provide the operational need." Matt Vespa, senior staff attorney with Sierra Club, noted,“This decision is just more of the same from the CPUC. What they did today will lock San Diego into paying for a multi-billion-dollar gas plant, a proposal that was drafted behind closed doors."